I want to thank the faithful who have been following my 31 Days of Nostalgia series. There have been lots of great comments. My post today may well be my favorite in this series. I am sharing my Barbie dolls. All five of these dolls were my childhood dolls. 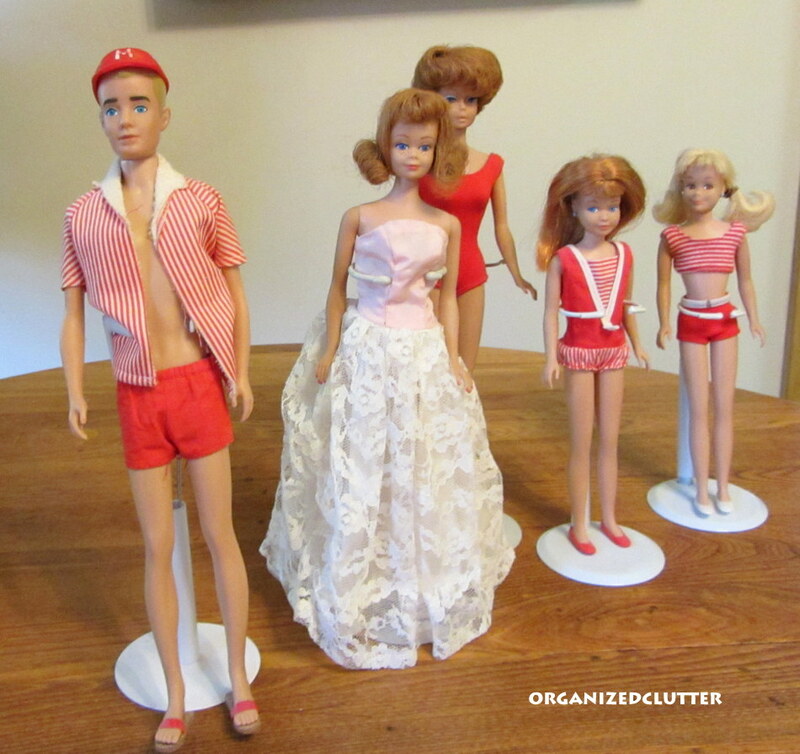 Your Barbie dolls may look different than mine, but I bet almost all of you have memories of Barbie. 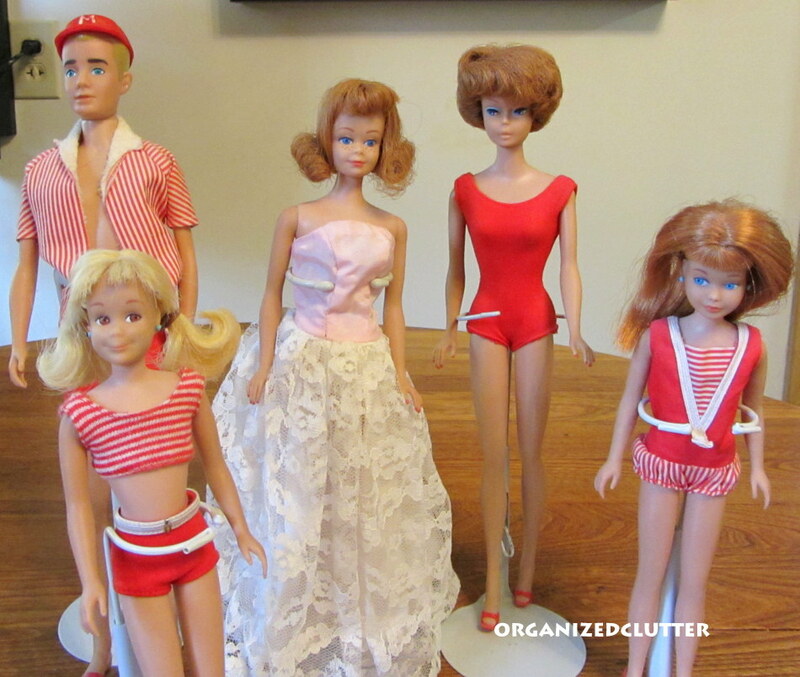 Titian (redhead) bubble cut Barbie in the red swimsuit was made 1962-1967. 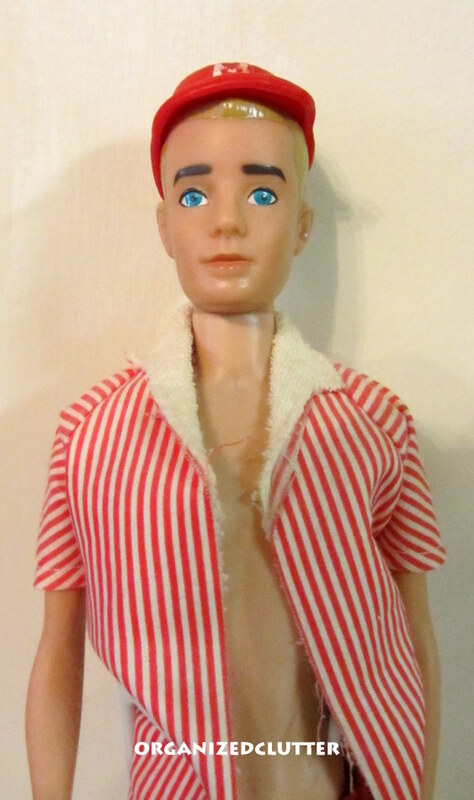 And here's Barbie's beau, Ken. 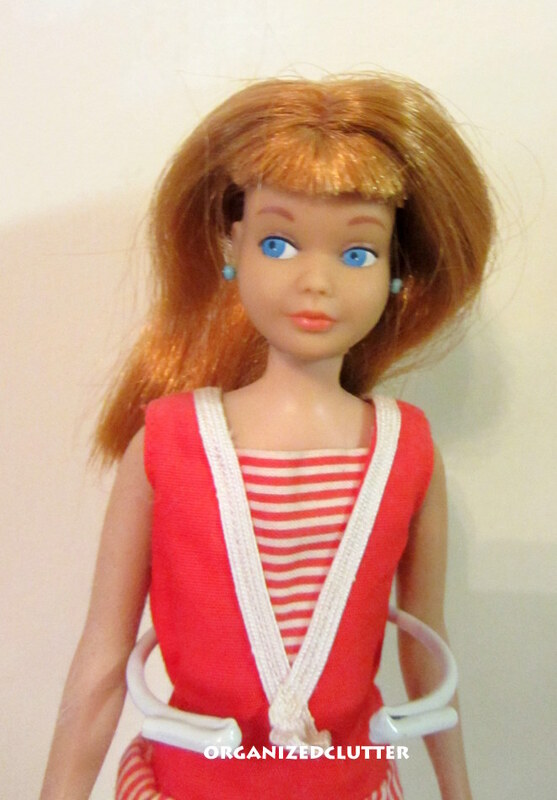 And here's Midge, Barbie's bff. Poor Midge required a costume change as the bottoms of her two piece bathing suit are missing! And Barbie's little sister, Skipper. Not sure if she came with pierced ears or if my little sis pierced them. I have displayed my old Barbies from time to time. Of late, they are up in a box in the closet. Some of my friends have asked why I don't sell them to collectors. I don't need a few hundred bucks that bad that I would sell this childhood memory. That's Day 7, my 1960's Barbie dolls. Joining Rebecca Meet Me Monday. My heart jumped when I saw 'Barbies'!! I had one of the original Barbie's! I played like crazy with her. I had others and Ken but most of them were given away when we moved to Hawaii! I still have my original Barbie and I even let my girls play with her. She is in sad shape but I love her! I have some of the original clothes also. Thanks for sharing and bringing back some GREAT memories for me! I don't have Scooter, but the rest I have...I don't know why I don't get rid of them, but I just cant!! I have one of the very first Barbies and Ken;s. My Barbie has the black hair. She has the sticky skin......probably the first year they were made. Ken has fuzzy hair and some has rubbed off.....I know he is early as well. I don't have her earrings or stand but I have some of the clothes like the balck and white swim suit. My daughter wants me to sell them. It is hard to give them up. Yours are sweet......I love Midge and Skipper. Heck. According to today's society, Midge doesn't even needa bikini bottom! I love that you have one of each doll! That's amazing. I have my original barbie and she is missing one tennis shoe. But I love her. I had a blonde bubble cut Barbie, an older Barbie with a pony tail, a dark haired Midge, the same skipper and Ken as yours and a newer Ken. 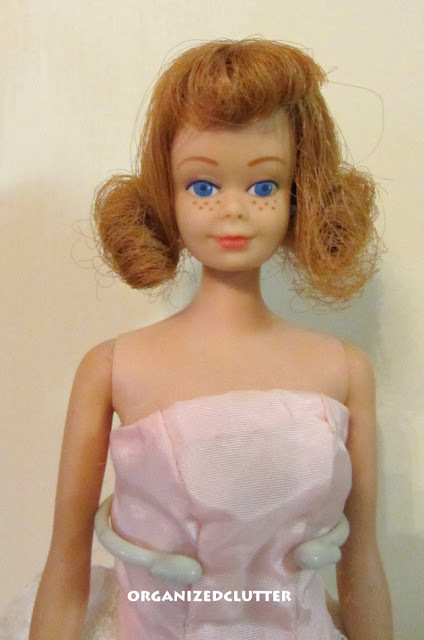 I also had a red headed doll the same size but not a Barbie. Lots of clothes, many made by myself and a Barbie camper so they could all go on vacation. I gave them all to a friend's little girl when we moved cross country when I was 21. Thanks so much for the great memories! You know I love dolls, but oddly enough I think I was the only girl never into Barbie. All my friends had 20 Barbies along with the dream House, the sports car, and an endless supply of clothes. I always preferred playing with my baby dolls instead, but eventually I did wind up with 3 Barbies and a Ken doll. Funny how people who aren't attached to dolls always want you to sell them. I have several of my dolls from my childhood, and it's my brother who suggests I could make money selling them. Like you said, the sentimental value of them is worth way more than their monetary value to me. I agree that if they make you happy, you shouldn't party with them. I have four of the five you featured today. Sadly there wasn't a man in the house. Occasionally my brother's GI Joe came to visit. Mine were in mint condition until I let our girls play with them. Oh what treasures! I loved my Barbies! My sister had the same Midge & Skipper. This post brings back great childhood memories. How fun and what a neat idea for a post! 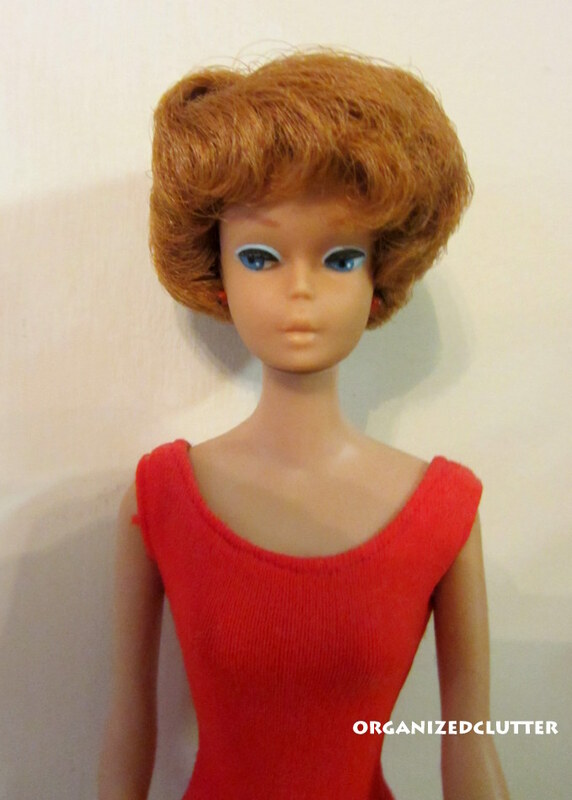 I have Midge and the bubble cut Barbie myself, although they were garage sale purchases, I think. My bubble cut's hair comes off like a wig! Tee hee! I still have them in a case. I cannot part with them. So fun! I had that same Barbie! My babysitter made an entire wardrobe for her one year for Christmas. Thanks for the memories! Loved this little piece of nostalgia. I just missed having Barbie Dolls but that doesn't keep me from appreciating them. It's neat that you still have yours! I guess I'm the other person in the world who didn't have Barbies. My friends did though, so I have Barbie memories from their houses. Usually we were busy building forts out in the woods or running through the neighborhood playing games or we were at the beach. Dolls weren't really on my radar. I do have to say to Ken, "my, what skinny legs you have!". They are quite feminine. Maybe that's why he wore his shirt open, to counter those girly legs. Ha! I love your Barbie collection, and their outfits are pretty cool. I really like the BFF Midge with her freckles. 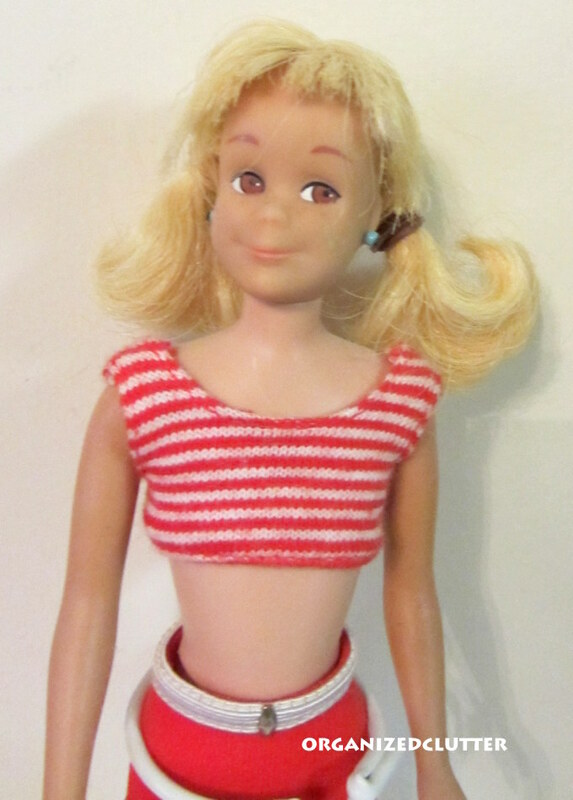 I myself never owned a Barbie, I had a chatty Cathy since it was so fitting for my personality! Thanks for sharing your inspiration with Sunday’s Best – you helped make the party a success! How much fun to still have and enjoy your Barbies. Thanks for showing them to us. Oh the memories! I still love dolls! Sell them? But why? You've practically got the whole fam damily. I'm a Barbie girl :) Love Barbie and always will. So fun seeing yours. You have a little treasure trove there!! How fabulous that you kept them! !